The original built-in lighting for the OU microscope uses a 2.2V 0.25A incandescent bulb, running from 2 cells. The heavy current consumption makes this expensive so it is worth looking at the use of white LEDs. One method is described by Brian Darnton in Micscape, July 99. 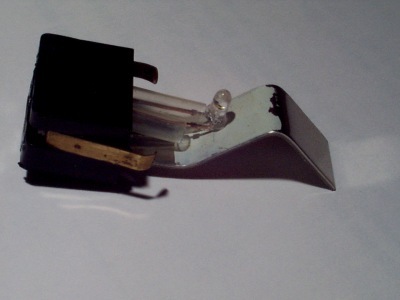 This used a 12V battery and series resistors to provide a carefully limited current for the LED that was placed in the "Direct View" hole, i.e. directly above the condenser. 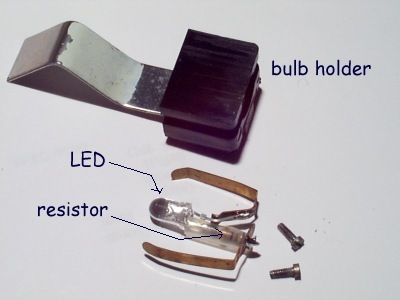 I chose an alternative approach, which uses the original bulb holder to take the LED and series resistor and retains the original battery arrangement. However, as pointed out in the refurbishment instructions, modern AAA batteries (e.g. MN2400) are slighly too fat to fit in the OU microscope - you can push 'em in but they won't come out again! A few minutes careful work with a round file on the top section and the part with the "M" spring in it (you can easily remove the spring to let the file do its job) soon fixed that problem. The cells must be able to slide freely or they will not retain contact with the brass strips above them. I used a 22 Ohm series resistor, which sets the current to about 4mA. This seems to be adequate with the LED that I used - bought from Farnell Electronic Components, order code 993-852 . Short lengths of sleeving round the LED legs avoids short circuits. The result is a nice even illumination that should run for more than 100 hours on one set of batteries. Observe polarity of the LED and mark the inside of the microscope case to remind yourself which way to insert the batteries. The disadvantage of my method compared with Brian's is that there is little "spare" voltage to drop across the series resistor. Hence, when the battery voltage drops, so the current through the LED will fall quite fast. Brian's use of a 12V battery effectively eliminates this problem. Even so, I have run mine continuously for more than 24 hours without problems. Obviously, if you can find a suitable battery to fit the space then use of the higher voltage with a higher value series resistor could still be assembled as I have done. My first version used a 5mm LED pointing at the painted area of the reflector strip, just as the filament bulb had done. These photos show how it looked. I then decided that it would make better use of the light to have a smaller, 3mm diameter LED arranged so that it points down from the centre of the painted part of the reflector, effectively producing the direct illumination as in Brian's arrangement but allowing the light to be slid out of the way if "direct view" or "external lighting" is required. 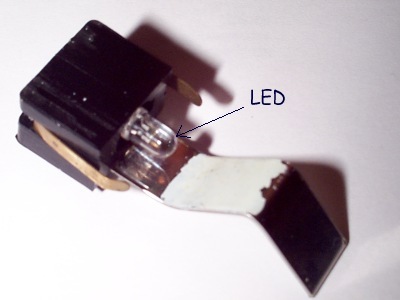 Take care not to crack the LED body when bending the leads as close as possible to the body. For details of servicing the OU microscope see this Micscape article by Guido Santacana. The Open University microscope is a portable model based on the McArthur design. This microscope is available secondhand via the Microscopy UK On-line shop. Comments to the author John Garrett are welcomed.